We have found the lost entry for the most feared and dreaded Dalek in The Hitchhiker's Guide to the Galaxy. This article was submitted to the guidebook by the most prestigious and prolific researcher known only as The Doctor. Of whom most would be aware of his exploits as documented in a show known as Doctor Who on the insignificant planet Earth. Earth of which you may remember was involved in the strange and twisted events with the Vogon construction project. We must also send special thanks to our intrepid researcher solidbronze who found the lost entry, watch below. 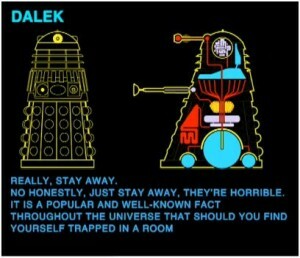 This is hilarious, being a fan of both Doctor Who and The Hitchhiker's Guide to the Galaxy this is a perfect blend. I want more now. What about an entry on Cybermen, or Torchwood next.